the most common type of aneurysm, occurring in the abdominal aorta and other large arteries, primarily in old people; often associated with atherosclerotic changes in blood vessels in other parts of the body. 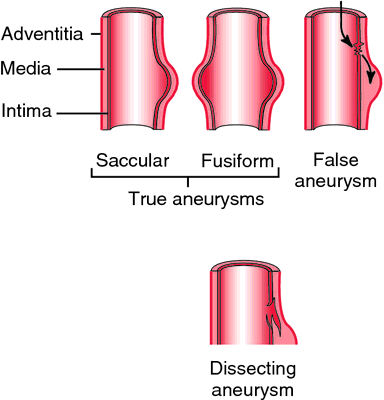 Most common type of aneurysm, occurring in the abdominal aorta and other large arteries, primarily in old people. The maximum RRT, the minimum WSS, and the maximum OSI in the atherosclerotic aneurysms (AN5 in Case 2 and AN8 in Case 3) were longer, lower, and higher than the other nonatherosclerotic ones (AN6 in Case 2 and AN7 in Case 3) (Table 2). The inflow volumes of atherosclerotic aneurysms (AN5 and AN8) were almost equal to the other nonatherosclerotic ones (AN6 and AN7) (Table 3, Figures 9(b) and 10(b)). True isolated atherosclerotic aneurysm of the axillary artery.